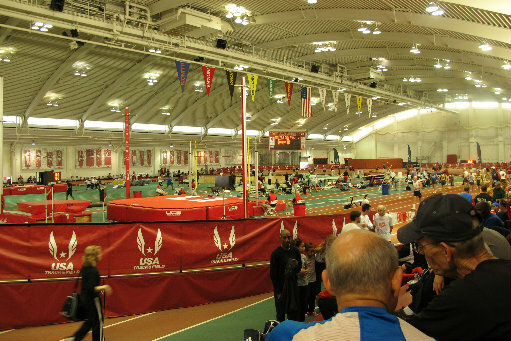 As most of you know, for the past few months, I was training to run a leg of the Women's 4x800 (half mile) in the Indoor Track and Field Championships (read my related posts here and here) in Bloomington, Indiana that took place last Saturday, March 17. In the months, weeks, days, hours, minutes, and seconds leading up to the race I was a nervous wreck. My stomach did flip flops every time I thought about the race, I worried about letting my team down, and had doubts about running as fast as other runners at the meet. After all, I hadn't run a track race since college and hadn't run a 800 meter race or as part of a relay team since high school. On Friday, our flight to Indianapolis was delayed and I am sad to admit that part of me hoped it might not leave so I wouldn't have to run. Still, after an hour delay, the DC half of our team, my friend Laura and me, boarded our plane and a little while later arrived in Indiana. There, we met up with the other half of our team - Eileen and Deb. Three of us had run at the George Washington University and the other was our coach. We had all continued running and participating in other sports, but we had never run a relay together. Saturday, race day, rolled around and along with it a new wave of nerves. 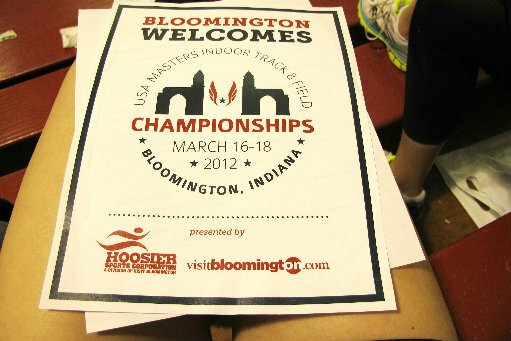 We arrived at the Indiana University track around noon and I began to panic as we pulled into the parking lot. Our race was only a little over two hours away. We got settled in the bleachers of the field-house where the track was located and waited around a bit until it was time to warm up for our race. While we were waiting we got to watch other races and talk with some of the other athletes. They were all pretty amazing people. We met a woman who had set several world records throughout the weekend at age 75, but was still selected by the officials for a random drug test. We saw 65 year old men run 5:00 minute miles, and 40 year old men run 4:30 miles, times I could only run in my dreams. We also witnessed four 90+ year old men set a world record in the 4x200 for their division. Watching these other athletes helped me realize that no matter how nervous I was, if these athletes who are decades older than me were still not only running, but competing -usually in a number of events - I was capable of running 800 meters one time. This was about the time our team also figured out that if we just wait 50-60 years, we just might be able to set some world records of our own. Our race started around 2:20 p.m. None of our 800 splits were timed, but based on our final time we all ran sub-3:00 minute half miles (my goal for the day) and we ran well, coming in first in our division. 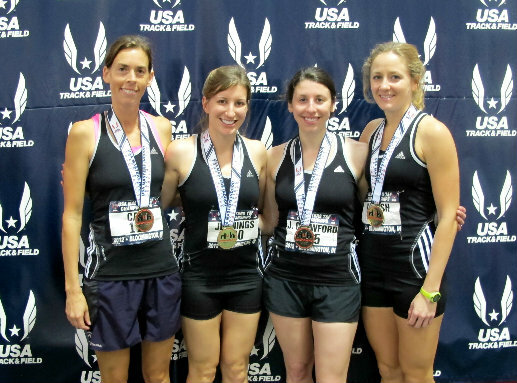 We were awarded gold medals and then headed back to Indianapolis to celebrate our girls weekend, our race, and, of course, St. Patrick's Day. After weeks of being nervous over the race, I finished the race. There are things I could have done differently and I am sure I could have been a bit smarter about training, but as we cooled down after the race, I told my teammates that I would run again with them next year when the track meet moves to this neck of the woods. I figure with a year to prepare, I may just be able to get my nerves under control by then. It also turns out, running track can be fun - who knew? I am so extremely proud of my team. These are seriously some of the best friends and amazing runners and women anybody could ever know. I am also happy I tried something I have never tried before - running in a track meet after high school and college (goal 27 of my 30 for 2012).